I read this passage last week while I was on a mission trip to Honduras. I am convinced the juxtaposition of the reading and the trip was divinely arranged. While in Honduras, I expected to meet a suffering mass of people living in poverty. What I found was happy, joyful people – many living in poverty – but with time to spend with others: Time to sing, time to worship, and time to enjoy life. It hit me that while many Honduran people live in material poverty, many of us in the United States – myself included – live in spiritual poverty. The people of Honduras lack many of the material benefits we have in abundance, like clean drinking water and adequate sewage treatment. Because of the time-sucking obligations of our material abundance, however, we have little time left for others or life’s simple pleasures. The two worship services I attended in Honduras (at two different churches) both exceeded two hours in length, not including fellowship time before and after. At my church, people get antsy when a worship service approaches one hour. We have things to do and possessions to care for – yards to mow, sports teams to follow, children’s activities to attend, and housework to be done. We are busy, busy people and must actually schedule visits to see friends and family. I am reminded of the story of Mary and Martha in the Gospel of Luke. Martha is so busy preparing for Jesus’ visit that she misses the blessing of the actual visit. Mary leaves the housework alone and sits at Jesus’ feet to experience the blessing of his fellowship. Do not get me wrong – cooking, cleaning, dusting, mowing, and painting are all important activities, especially when there is an abundance to be cooked, cleaned, dusted, mowed, and painted. The contrast is stark, however, between seeking a blessing from our “stuff” and being blessed by the presence of others. I think there is need to find a balance. We can help the Hondurans with some basic needs. They can help us learn to live with less, freeing up time for relationships with each other and with our God. Come home to church this Sunday. Be a blessing to another and be blessed. Last week I attended the memorial service for a cousin of my father’s. It was at the Ebenezer United Methodist Church, 3 miles south of Green and about 8 miles west of Leonardville. A group of German Methodists immigrated to the area in the 1870s and established the church, barely a decade after the Civil War. My great-grandfather, a child at the time, was among them. The remote location of the church is memorable, as miles and miles of farmland surround it. It is on the slightest of rises in an otherwise flat expanse of pasture, wheat, and soybeans. Ebenezer UMC is a familiar church because of family reunions, funerals, and other gatherings I have attended there since I was a child. It is a plain, no-frills, wooden structure. There are no stained glass windows, no fancy stone or woodwork, and no vaulted ceilings. This church was built for function, not form, consistent with the folks it was built for – practical, down-to-earth, and humble. 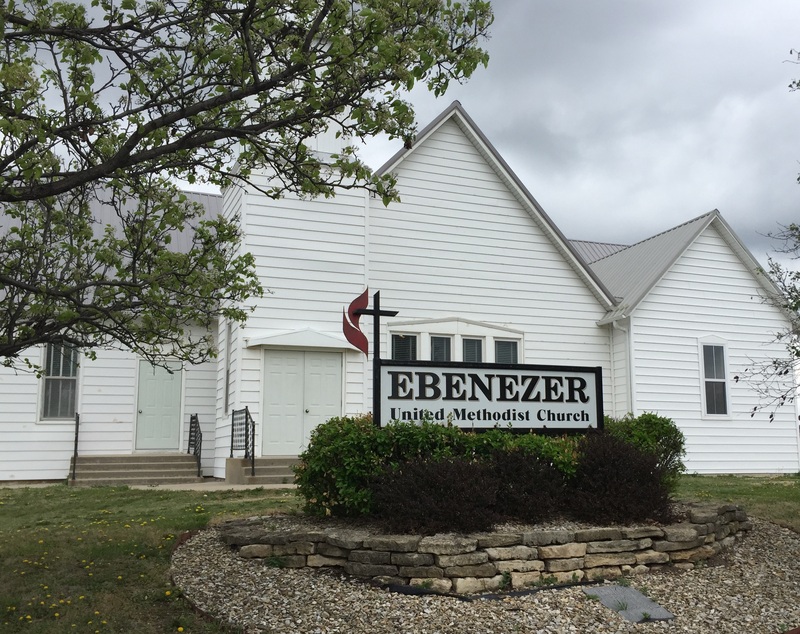 I always found Ebenezer UMC disquieting, due in part to its name. Perhaps it reminded me of Ebenezer Scrooge – bah humbug! Perhaps it was the puzzling line from an old hymn: Here I raise my Ebenezer; but something about the name made me think of ancient and haunted things. The church stands proud, however, on this unforgiving, horizontal vastness, tempting the unrelenting Kansas winds to blow it off its foundation. At least in my lifetime, no storm has phased it. The biblical references to Ebenezer are in the Old Testament book of 1 Samuel. I assume the “stone” that Samuel placed was large enough to be seen for miles. That stone, which he named Ebenezer, stood as a symbol of God’s constant and helpful presence throughout their struggles. Before the Israelites crossed the Jordan River into the Promised Land, they gave up everything they knew for the promise of a new life. A group of Methodist immigrants gave up everything familiar and crossed the Atlantic Ocean for a similar promise of a new life. They landed in a vast country where they could eke out a reasonable living with the sweat of their brow. In the midst of this fertile soil, they erected a visible reminder that God is good; a place to call the faithful to worship and, in their time, to call the saints home. An Ebenezer – a symbol of hope, a reminder of God’s presence – is a good thing to have as we weather the storms of life. God is always near, but sometimes we forget. When we enter new life territory, when we feel lost and alone, when we need to remember, may there always be an Ebenezer in sight. Come home to church this Sunday. Where is your Ebenezer? The theme for the 2nd week of Advent is Peace, and I have been doing a lot of thinking about peace, lately. I participate in a number of national discussions relating to my profession, and the debates are not always civil. In fact, some of the comments become downright nasty. It is in this context of disagreement that I contemplate peace. In my opinion, for peace to exist between two or more people (or countries), there must first be a foundation of mutual respect, as well as an acknowledgement that all points of view have value. I do not have to agree with someone to co-exist peacefully with them. I do not even have to like them. I do have to accept their right to believe as they do, however. It is clear to me that our core differences are exposed by what we cannot discuss civilly. Peace cannot be present when one or both sides are defensive. We become defensive when we feel threatened. As long as another person’s point of view on a particular topic threatens me, we will be unable to have a peaceful or productive discussion on the topic. Rather, we will argue about it. When defensiveness enters a conversation, minds slam shut. When minds slam shut, there can be no dialogue, because true dialogue requires giving and receiving. Closed minds cannot receive. An open mind is willing to hear and consider alternate points of view. Open minds create opportunities to discover higher truths. A higher truth is one that encompasses both original points of view, but goes farther than either goes alone. It does not deny the truth of the individual thoughts, but it includes and then moves beyond them. This higher truth, once reached, is not threatening to either party since it includes what was important to both. Higher truths allow for civil interaction between people and countries. Only by doing the work to discover higher truths will we know peace in our lives or world. Jesus modeled higher truths throughout his ministry. He accepted his followers as they were and sought to raise them up to his level. Consider the woman caught in the act of adultery, who was about to be stoned to death (John 8). Jesus invited those without sin to cast the first stone – and no stones were thrown. He pointed out the higher truth that all are sinners. Jesus intentionally sought out those that society rejected in order to bring them into his circle of life. The prophet Isaiah wrote about the authority of Jesus hundreds of years prior to Jesus’ birth, describing how his authority would grow continually and bring endless peace. We cannot imagine this type of peace in our deeply divided world. We can, however, follow the example of Jesus and seek higher truths that accept others where they are and lead us all to a higher, more peaceful co-existence. Come home to church this Sunday. Reaching for higher truths will bring peace. Having faith, however, is not a team sport – having faith is an individual decision. While people often give credit to others for instilling a strong faith in them, faith can only take hold when a person makes a personal decision to believe. For example, I could easily say my faith was handed down to me from my grandparents, through my parents. Although my parents and grandparents were people of strong faith, my decision to believe – to develop a faith of my own – had to be mine. Furniture, property, pictures, life stories, and life lessons can be passed from generation to generation. Examples of lives of strong faith can serve as models, but for me to be faithful, I must decide to have faith. So what, exactly, does it mean to have faith? Among the dictionary definitions are “confidence or trust in a person or thing” and “belief that is not based on proof.” For me, faith is a decision to believe there are forces at work that I cannot see, touch, hear, smell, or fully understand. For example, I do not understand electricity, but I use and rely on it all day, every day. I do not understand how the earth remains in its orbit around the sun, but every morning I believe the sun will rise. Having faith in a person or thing means we do not have to micromanage, or otherwise be in charge of or worry about them. We trust their functional design or their good intentions or their competence, and we rely on them – our faith instills confidence in their dependability. Because faith is an individual decision, we can choose to have faith in different things and/or people, not all of which will be beneficial to us. Having faith establishes a connection that empowers both ends, meaning both the believer and the believed in. Once we believe in a benevolent God, we acknowledge and empower our connection with God and begin to see evidence of God working in our lives. Until, however, we establish that connection – develop that faith – we cannot see the evidence. If we chose to believe life is a random series of unrelated events, however, we establish a connection that will provide evidence for our faith in the chaotic nature of life. The choice is ours. And our choices impact how we experience life. Faith is not just about church, but about life. Come home to church this Sunday. The choice for a life of faith is yours. One of today’s great tragedies is the lack of an accurate and reliable self-image. The increasing numbers of human beings who are uncertain about their standing as a family member, co-worker, life-partner, friend, and – most heart breaking of all – as a child of God, is troubling. Poor self-esteem, along with a self-image that rises and falls as far and as fast as a roller coaster, is at the root of many of today’s problems. We do violence to others and ourselves when we do not honor and acknowledge our inherent worth. The problems of poor self-image are most pervasive in women – especially with teenage girls – but both genders and all ages fall prey to unrealistic, societal expectations. In a recent TED Talk (www.ted.com), Meaghan Ramsey discusses why thinking you are ugly is bad for you. She explains that about 10,000 people per month Google the phrase, “Am I ugly?” It is truly heart breaking, and she mentions research indicating that uncertainty about one’s image negatively affects test scores, initiative, and relationships. How have we descended into such an uncertain and inaccurate identity crisis? The Bible is very clear about our image: fearfully and wonderfully made; a little lower than the angels; made in the image of God. Unfortunately, the voice of Scripture cannot easily drown out the unrelenting images on television, the constant pressures of social media, or the intense scrutiny of a typical schoolyard. The Information Age brings much that is good for society, but it also peppers us with a constant barrage of misinformation about how we should look, act, speak, and perform. We never know who actually sets those unrealistic standards, but we do know – most of us, anyway – that they are unattainable, unsustainable, and unhealthy. Still, we persist in our belief that we must mimic these airbrushed, carefully scripted, heavily edited, and overly sexualized images in order to be successful, to be loved, or to be worthy. Ms. Ramsey tells the story of a teenage girl who recorded and posted a video, asking, “Am I pretty?” Predictably, she received thousands of replies, many of which were vulgar, hurtful, and blatantly untrue. How can we stop looking to social media, television, and movies for validation of our self-worth and begin looking to those who love us most, including God? A solid church is a good place to begin. Supportive youth gatherings, covenant fellowship, and support groups help us understand that we are not the only ones who struggle with seeming imperfection. Retaining a healthy outlook about our appearance has everything to do with whose standards we use to judge ourselves. “Mirror, mirror on the wall, who’s the fairest of them all?” Who answers that question for you? Come home to church this Sunday. Celebrate the miracle God created in you! Snake handling, as a demonstration of faith, dates back for centuries. In February of this year, Pentecostal pastor Jamie Coots, died of – you guessed it – a bite from a rattlesnake he was handling as part of a worship service. It is one thing to believe God will be with us as we go through our lives, but it is an entirely different matter to believe God will protect us from all of our precarious choices. I have no doubt God has my spirit safely in hand; but I am somewhat less assured of God’s protection over my earthly body – particularly when I use my God-given free will to take perilous chances. Obviously, everyone makes bad decisions at times. We all have different levels of risk tolerance, and most of us engage in a number of activities that may have negative consequences. Heck, getting out of bed in the morning has some risk – as does staying in bed. We weigh our risk-tolerance against our need for a new experience, or a familiar experience, or to attempt to avoid an undesirable experience. In fact, we all have rattlesnakes of some sort we choose to live with – risky hobbies, abusive relationships, substance abuse, driving too fast. Sometimes we believe we have no better options, and that is where our lack of faith plays a key role. We grab whatever our familiar rattlesnake is and hold on for fear of the alternative, knowing the snake we hold can kill us.